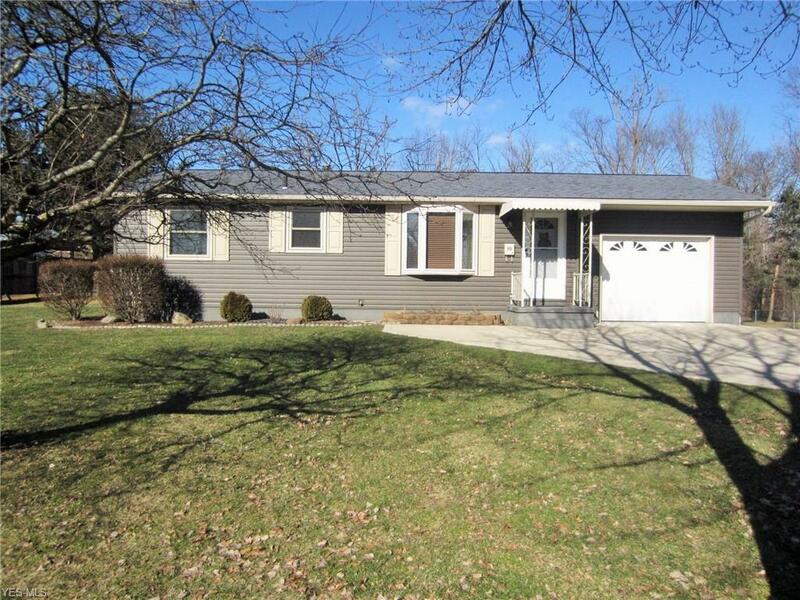 Absolutely beautiful 2 bedroom ranch on a gorgeous partially fenced in lot. This home has been very well cared for and loved! Spacious bright living room with bay window and opened to the large eat-in kitchen which features lots of cabinets, all appliances included, and beautiful ceramic tile flooring. Nice full bath with ceramic tile flooring matching the kitchen, super soaker garden tub with tiled tub surround. Down the hall you'll find the two generous sized bedrooms with ceiling fans, and the same upgraded laminate flooring found in the living room and hallway. Off the kitchen are sliders leading you to the large wood deck and concrete patio! Large shed and a beautiful scenic view, deer visit often. Newer gas furnace, central air conditioning, and sump pump in the partially finished basement with glass block windows! Trust me, this beautiful home on a very large lot will not last long! Nothing to do but move in and enjoy!